Background: Combretum albidum Don belonging to family Combretaceae is an unexplored medicinal plant in the Indian medicinal system. According to ethnobotanical information, the leaves are used in the treatment of peptic ulcer and its fruits are used in diarrhoea and dysentery. Stem bark is used in the treatment of jaundice and skin diseases. The problem encountered in standardisation of this medicinal plant is its identification by source. Materials and Methods: The pharmacognostical studies were carried out in terms of organoleptic, macroscopic, microscopic, physicochemical, florescence and phytochemical analysis. Physicochemical parameters such as total ash, moisture content and extractive values are determined by World Health Organization guidelines. The microscopic features of leaf components are observed with Nikon lab photo device with microscopic units. Results: Macroscopically, the leaves are simple, obovate in shape, acuminate apex, entire margin and smooth surface. Microscopically, the leaves showed a large vascular strand that consists of thick walled xylem elements mixed with xylem fibres and phloem which is present in a thin layer along inner and outer portions of xylem. External to the xylem occur a thin line of sclerenchyma. Powder microscopy revealed glandular trichomes in the adaxial epidermal peelings also shows the non-glandular trichomes fairly common in powder and epidermis with anisocytic stomata. Vessels elements are narrow, long, cylindrical and dense multi-seriate bordered pits. Xylem fibres are thin and long, with thick walls, which are lignified. Preliminary phytochemical screening showed the presence of carbohydrate, glycoside, saponin, flavonoid, phytosterols and phenolic compounds. Conclusions: The results of the study can serve as a valuable source of pharmacognostic information as suitable standards for identification of this plant material in future investigations and applications. Natural products have served as the source and inspiration for a large fraction of the current pharmacopoeia. Although estimates may vary depending on the definition of what is considered a natural product-derived drug, it is safe to say that between 25% and 50% of currently marketed drugs owe their origins to natural products. Combretum albidum (C. albidum) Don belonging to the family Combretaceae and commonly known as "buffalo calf" in English [Figure 1]. It is extensive a woody twine occupying the canopy of the host tree. Its distribution is restricted to the semi evergreen and dry deciduous forests, along river banks. Paliyan tribes in Sirumalai hills of Eastern Ghatsuse the fruit of this plant for the treatment of diarrhoea and dysentery,  stem barks for Jaundice  and skin diseases , and leaf for peptic ulcer. Ethnobotanical survey of the woody species of Kalrayan and Shervarayan hills's tribal societies use wiry-stem, seed oil and root for the treatment of eye problems, eczema, and malaria. C. albidum crude extract was reported to possess antibacterial activity against different bacterial strains. However, available literature revealed that no pharmacognostic study has been carried out on the plant except on the stem bark; hence the present investigation was conducted with the objective of evaluating various parameters such as macroscopic, microscopic characters and phytochemical evaluation of the plant. Fresh leaves and roots of C. albidum were collected from forest of Tirupati, Andhra Pradesh (India), identification and authentication was done by Dr. Madhava Chetty, Professor, Department of Botany, Sri Venkateswara University, Tirupati under reference number (SVU/SC/19/82/10-11). Various sensory parameters of the plant material such as colour, odour, size, shape and taste were studied by organoleptic evaluation. In microscopic evaluation, studies were conducted qualitatively and quantitatively. In this study, transverse sections of leaf were studied under photomicrograph. The various distinguishing characters were studied with staining and without staining and recorded. Care was taken to select healthy and normal leaf material. The required samples of leaves were cut and removed from the plant and fixed in formalin 5 ml + acetic acid 5 ml + 70% ethyl alcohol 90 ml. After 24 h of fixing, the specimens of leaves were dehydrated with graded series of tertiary-butyl alcohol as per the schedule given by Sass, 1940. Infiltration of the specimens of leaves were carried by gradual addition of paraffin wax (melting point 58-60°C) until tertiary butyl alcohol solution attained super saturation. The specimens of leaves were cast into paraffin blocks. The paraffin embedded specimens of leaves were sectioned with the help of rotary microtome. The thicknesses of the sections were 10-12 μm. Dewaxing of the sections was done by customary procedure. The sections were stained with toluidine blue as per the method published by O'Brien et al. Since toluidine blue is a polychromatic stain. The staining results were remarkably good and some cytochemical reactions were also obtained. The dye rendered pink colour to the cellulose walls, blue to the lignified cells, dark green to suberin, violet to the mucilage, blue to the protein bodies etc., Where ever necessary sections of leaf were also stained with safranin and fast green and iodine potassium iodate (for starch). For studying the stomatal morphology, venation pattern and trichome distribution, para dermal sections (sections taken parallel to the surface of the leaf) as well as clearing of leaf with 5% sodium hydroxide or epidermal peeling by partial maceration employing Jeffery's maceration fluid  were prepared. Glycerine mounted temporary preparations were made for macerated/cleared leaf. The dried leaves were powdered. Powdered material was cleared with sodium hydroxide and mounted in glycerine medium after staining. Different staining reagents such as toluidine blue, safranin, fast green and iodine were used. Different cell component were studied and measured using photomicrography. The organoleptic evaluation of the leaves indicated dark green colour on the upper surface and slightly light green colour on the lower surface. The powder of leaf appeared dark green in colour, coarse in texture and unpleasant in odour with slightly tingling taste. The macroscopic evaluation involved study of morphological characters and taxonomy. The morphological characters of leaves were observed as deciduous. The composition of lamina was found to be simple, pinnate reticulate venation, entire margin, acuminate apex, smooth surface. The arrangement of leaves was found to be opposite decussate, shape was lanceolate, ovate, oblong and the base is cuneate. The size of leaves was found to be 16 cm in length and width 7.8 cm and petiole 1-1.5 cm. Physicochemical analysis of leaf powder viz. Ash values, extractive values and moisture content are presented in [Table 1]. The preliminary phytochemical analysis of leaf was shown in the presence of glycoside, carbohydrate, flavonoid, phytosterols, phenolic compounds and saponin. 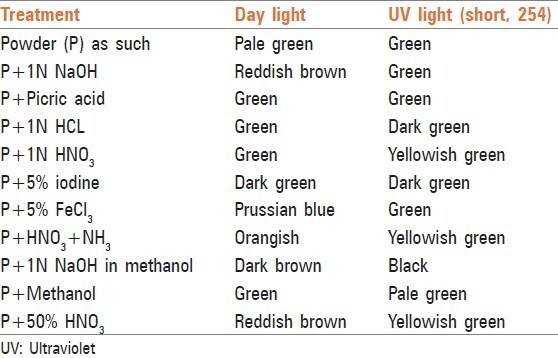 The fluorescence analysis of C. albidum leaf under day and UV (short 254 nm) light is recorded in [Table 2]. The leaf had thick midrib and smooth and even, dorsiventral lamina [Figure 2]a. The midrib was plano-convex with flat adaxial side and thick, broad abaxial part. It was 900 μm thick and 950 μm wide. The midrib consists of thin epidermal layer of spindle shaped thick walled cells. The epidermal cells were 10 μm thick. The ground tissue was parenchymatous. The parenchymatous cells were circular, compact and fairly thick walled. The vascular strand was large and omega shaped. It occupies the major portion of the midrib. The vascular strand consists of a wide bowl shaped part and the free ends of the bowl directed laterally into wings. The general outline was omega shaped [Figure 2]b. The strand was 300 μm thick. It consists of wide, angular, thick walled xylem elements which were arranged in compact parallel lines mixed with xylem fibres [Figure 3]a. Phloem occurs in thin layers along both the inner and outer portions of the xylem [Figure 2]b and [Figure 3]a. The xylem elements were up to 50 μm wide. External to the xylem outline occur thin line of sclerenchymatous boundary. The sclerenchyma cells abutting the two arms of omega shaped xylem strand were extremely thick and highly lignified. The prismatic type of calcium oxalate crystals occur in the outer phloem zone [Figure 3]b. The lignified xylem elements and calcium oxalate crystals appear bright under polarised light [Figure 3]b. The lamina was smooth and even on both surfaces [Figure 4]a. It was 650 μm thick. The adaxial epidermis includes thick and wide, rectangular epidermal cells with prominent cuticle. The cells were 20 μm thick. The abaxial epidermis was comparatively thinner measuring 12 μm thick. The cells were squarish and thick walled. The mesophyll tissue was differentiated into thick adaxial zone of palisade cells, which were cylindrical and compact. They were 50 μm in height. The spongy parenchyma includes about seven layers of lobed loosely arranged cells. Calcium oxalate crystals of druses and sand crystal type were frequently seen in the powder. They occur in the unmodified mesophyll cells and were random in distribution [Figure 4]b. The epidermal tissue was studied from the para dermal sections of the lamina. The adaxial epidermal cells were apostomatic. The cells were angular in outline. The anticlinal walls were thick and straight [Figure 5]a. The abaxial epidermis consists of larger cells. The anticlinal walls were slightly thicker and undulate. The epidermis was stomatiferous. The stomata were anisocytic type. The stoma was surrounded by three dissimilar subsidiary cells [Figure 5]b. The guard cells were broadly elliptical and had wide aperture. They were 40 μm × 60 μm in size. The venation was densely reticulate. The veins vary in thickness. The major veins were thick and minor veins and vein lets were thin. The vein-islets were fairly distinct, but they vary greatly in size and shape. The vein terminations were either unbranched or branched once or twice. The terminations were thick and undulate [Figure 6]a and b. Figure 6 (a, b): Venation type showing vein islets and vein terminations. VI: Vein islets; VT: Vein terminations. Small fragments of adaxial epidermal peelings were frequently seen in the powder [Figure 7]a and b. Fragments were in surface view and exhibit the shape and size of the epidermal cells and circular plate of glandular trichomes. The epidermal cells were polygonal in outline. The anticlinal walls were fairly thick and straight. The epidermal layer was apostomatic. The glandular trichomes has short central hyaline stalk cell, which bears a thin plate of body cells. The plate consists of two circles of semi-circular cells. The plate was about 90 μm in diameter. The epidermal layer was stomatiferous. The epidermal cells were polygonal in outline. The anticlinal walls were fairly thick and straight [Figure 8]a and b. The stomata were cyclocytic. The guard cells were encircled by four to seven subsidiary cells. These subsidiary cells were semi-circular in shape and were of equal in shape and size. The guard cells were broadly elliptical and measure 20 μm × 30 μm in size. Epidermal, non-glandular trichomes were fairly common in the powder. The trichome was unicellular, unbranched, thick walled and uniform in thickness [Figure 9]a. The trichome was 600 μm long and 20 μm thick. Vessel elements were occasionally seen in the powder [Figure 9]b. They were narrow, long and cylindrical. They had circular wide end-wall perforation and dense multi-seriate bordered pits on the lateral walls. The vessel elements were 270 μm wide. Fibres associated with the xylem strands were seen in isolated condition they were thin and long [Figure 9]c. Their walls were thick and lignified. Some of the fibres were wider and bent [Figure 9]b. The fibres were 1.23 mm long and 10 μm thick. Anisocytic type of stomata was present on the upper side of the leaves. The stomatal number of the upper surface and lower surface was found as 20 and 16 respectively. The stomatal indexes of the upper surface and lower surface were found 13.2 and 11.7 respectively. The vein islet and vein termination were calculated as 20 and 11. The palisade ratio was found to be 8.5. Microscopical studies indicated that the presence of thick midrib and smooth, even, dorsiventral lamina. The midrib was plano-convex with flat adaxial side and thick, broad abaxial part. The vascular strand was large and omega shape and occupied major portion of the midrib. In lamina, the adaxial epidermis was thick and wide, rectangular epidermal cells with prominent cuticle compared to abaxial epidermis. Palisade cells were cylindrical and compact. The spongy parenchyma includes were seven layered of lobed loosely arranged. The calcium oxalate crystals occur in unmodified mesophyll cells in random distribution. In para dermal section of the lamina, the adaxial epidermis was apostomatic where as in abaxial epidermis was stomatiferous. The stomata were anisocytic type. Percentage extractives and ash analysis were carried out. The results showed that water soluble ash is more than the acid insoluble ash. Water soluble extractive value of leaf had shown 2 times more than alcohol soluble. Ash values of drug give an idea of earthy matter or the inorganic composition and other impurities present along with drug. Extractive values are primarily useful for the determination of exhausted and adulterated drugs. Extractive values are also useful to evaluate the chemical constituents present in the crude drug and also help in the estimation of specific constituents soluble in particular solvents. , The fluorescent analysis is carried out under the day light and the UV light by treating with different chemical that showed different colour. Results of fluorescent analysis of the leaves showed pale green colour for leaf powder as such in day light, green colour for leaf powder as in UV light. Reddish brown colour for leaf powder mounted in 1N NaOH as such in day light while green colour for leaf powder as such in UV light. Prussian blue colour for leaf powder mounted in ferric chloride as such in day light while green colour for leaf powder as such in UV light. This analysis suggests that, leaves extract of C. albidum probably contain active agent(s) and this provide the basis for their folkloric use as a cure for some human ailments. In conclusion, the parameters, which are reported for the first time, could be useful for identity and authenticity of this medicinal plant. Authors are thankful to Council of Scientific and Industrial Research, New Delhi, India for providing financial assistance to carry out the study. Authors also thank to JSS University Mysore, (India) for providing facilities to conduct this work. 1. Kingston DG. Modern natural products drug discovery and its relevance to biodiversity conservation. J Nat Prod 2011;74:496-511. 2. Bokhad MN, Rothe SP. Preliminary phytochemical investigation of Combretum albidum G. Don; An ignored medicinally important liana. J Exp Sci 2012;3:01-4. 3. Karuppusamy S. Medicinal plants used by Paliyan tribes of Sirumalai hills of Southern India. Natural Product Radiance 2007;6:436-42. 4. Sreedhar S, Kumar UP, Reema Shree AB. Pharmacognostic analysis of stem bark of Combretum albidum G. Don; An unexplored medicinal plant. Pharmacogn J 2012;4:13-6. 5. Swamynathan B, Ramamoorthy D. Flora of sacred groves and its ethno-botanical importance in Cuddalore district of Tamilnadu, India. J Res Biol 2011;1:88-92. 6. Ganesan S, Ponnuchamy M, Kesavan L, Selvaraj A. Floristic composition and practices on the selected sacred groves of Pallapatty village (reserved forest), Tamilnadu. Indian J Tradit Knowl 2009;8:154-62. 7. Ramasubramaniaraja R, Niranjan BM. Peptic ulcer: An overview. J Pharm Res 2011;4:156-60. 8. Kadavul K, Dixit AK. Ethnomedicinal studies of the woody species of Kalreyan and Shervarayan Hills, Eastern Ghats, Tamilnadu. Indian J Tradit Knowl 2009;8:592-7. 9. Mahida Y, Mohan JS. Screening of Indian plant extracts for antibacterial activity. Pharm Biol 2006;44:627-31. 10. Gupta PC, Sharma N, Rao ChV. Pharmacognostic studies of the leaves and stem of Careya arborea roxb. Asian Pac J Trop Biomed 2012;2:404-8. 11. Srivastava SK, Chaubey M, Khatoon S, Rawat AK, Mehrotra S. Pharmacognostic evaluation of Coleus forskohlii. Pharm Biol 2002;40:129-34. 12. Ministry of Health and Welfare. Indian Pharmacopeia. 4 th ed. New Delhi: Government of India, Ministry of Health and Welfare, Controller of Publications; 1996. p. A53-4. 13. WHO. Quality Control Methods for Medicinal Plant Material. Geneva: WHO; 1992. p. 22-34. 14. Raaman N. Phytochemical techniques. 1 st ed. New Delhi: New India Publishing Agency; 2006. p. 19-24. 15. Edwin S, Joshi SB, Jain DC. Comparative pharmacognostic studies on root powder of Plumbago rosea. Indian J Nat Prod 2008;2:27-9. 16. Chase CR Jr, Pratt R. Fluorescence of powdered vegetable drugs with particular reference to development of a system of identification. J Am Pharm Assoc Am Pharm Assoc 1949;38:324-31. 17. Sass JE. Elements of botanical microtechnique. 1 st ed. New York: McGraw Hill Book and Co.; 1940. p. 222. 18. Johansen DA. Plant microtechnique. 1 st ed. New York: McGraw Hill Book and Co.; 1940. p. 523. 19. O'Brien TP, Feder N, McCull ME. Polychromatic staining of plant cell walls by toluidine blue O. Protoplasma 1964;59:364-73. 20. Esau K. Plant anatomy. 3 rd ed. New York: John Wiley and Sons; 1964. p. 767. 21. Esau K. Anatomy of seed plants. 4 th ed. New York: John Wiley and Sons; 1979. p. 550. 22. Khandelwal KR. Practical pharmacognosy. 18 th ed. Pune: Nirali Publication; 2007. p. 146-8. 23. Metcalfe CR, Chalk L. Anatomy of the dicotyledons. Vol. 1. Oxford: Clarendon Press; 1979. p. 1-275. 24. Thomas S, Patil DA, Patil AG, Chandra N. Pharmacognostic evaluation and physicochemical analysis of Averrhoa carambola L. fruit. J Herb Med Toxicol 2008;2:51-4. 25. Kumar S, Kumar V, Prakash O. Pharmacognostic study and anti-inflammatory activity of Callistemon lanceolatus leaf. Asian Pac J Trop Biomed 2011;1:177-81.